Flamingo Beach, Renaissance Island, Aruba, Dutch Caribbean. About Flamingo Beach – A Private Beach in Aruba! Of all the beaches that Aruba is so famous for, there is one beach that makes Aruba even more unique. It’s called Flamingo Beach, a private beach on Renaissance Island where a handful of pink flamingos roam the sugary white sands and turqouise waters of the Dutch Caribbean. Renaissance Island is owned exclusively by the Renaissance Aruba Resort & Casino, and is the only place in Aruba where you can be so up close and personal with flamingos! You’ve probably seen the Youtube videos and the pictures on Instagram, these friendly feathery creatures have become quite the internet sensation the last few years. By now, they must have become the most insta-famous pink flamingos on the planet! If you’re planning a memorable trip to Aruba, visiting Flamingo Beach should definitely be on your bucket list. As their pink feathers contrast beautifully with the white sands and the clear blue waters of the Caribbean, the flamingos represent the perfect photo opp. If they’re up for it and feeling curious, they’ll gently eat right out of your hand while you take that ultimate selfie. However, as flamingos are sensitive creatures and space is limited on Flamingo Beach, meeting your new pink friends requires a bit of careful planning. To help you out, here’s everything you need to know about visiting Flamingo Beach, Aruba! Flamingo Beach can only be reached when you visit Renaissance Island, a private island that features a dense mangrove where the flamingos live. There are also two beautiful beaches named Flamingo Beach and Iguana Beach, both are Aruba’s only private beaches. Renaissance Island is privately owned, and belongs exclusively to the Renaissance Aruba Resort & Casino in Oranjestad, the island’s capital. 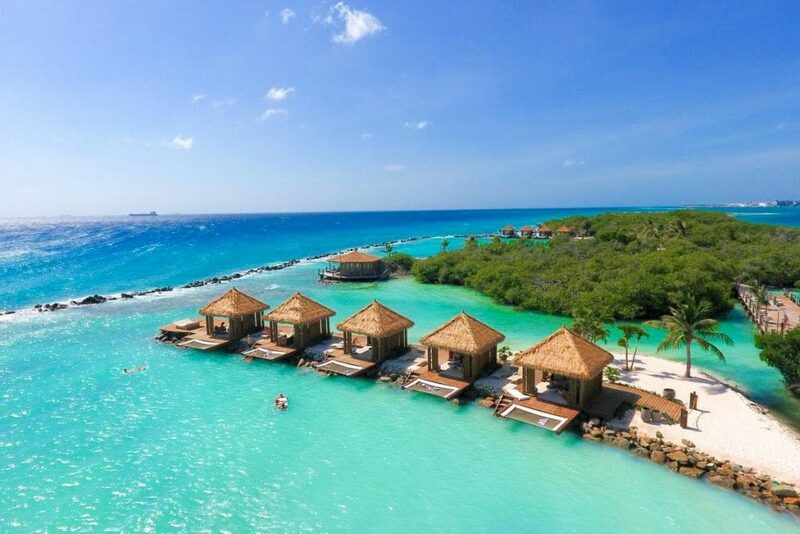 Private, ocean front cabanas at Flamingo Beach! Spend a night at the Renaissance Aruba Resort & Casino. Buy a day pass to Renaissance Island for $125. 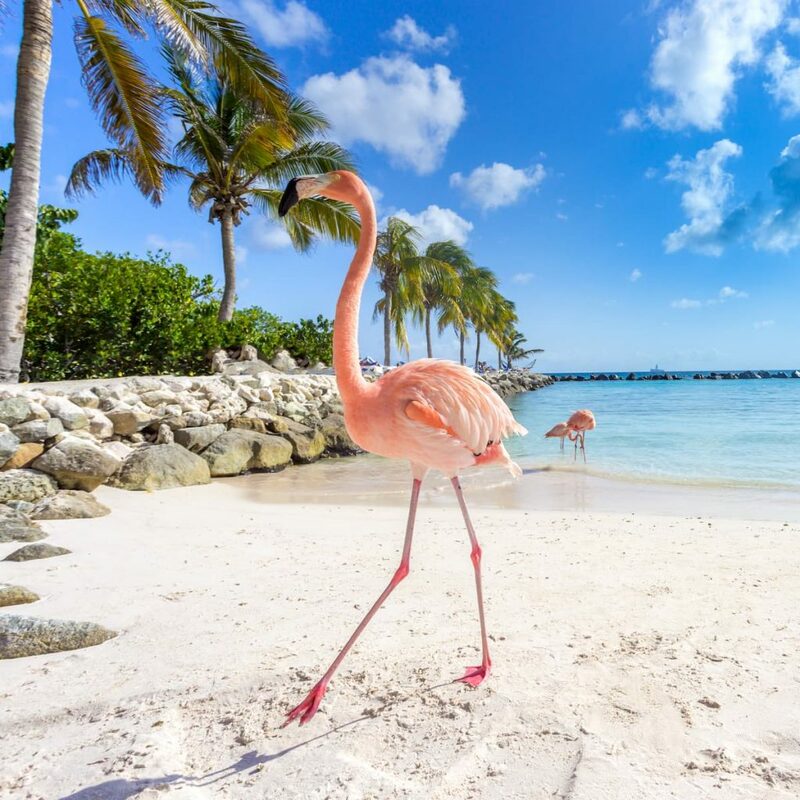 As guests of the Renaissance Resort have free access to the private island, the only way to guarantee to see the flamingos on Flamingo Beach is to book a room at the Renaissance Aruba Resort & Casino. The cost of a room usually starts around $150 for one night if you can get a good deal, but that all depends on season of course. It could be you’ll end up paying more than that. The resort is operated by Marriott, and is a great place to stay near Oranjestad. The Renaissance has a fantastic beachfront pool, a private beach section, a casino, a spa and a shopping mall. The best part is that if you stay at the Renaissance multiple nights, you get to visit Flamingo Beach every day if you want. For non-guests of the resort, day-passes to Renaissance Island cost $125 per person, but for children under 12 access is free. Note that Flamingo Beach is adult-only, which in this case means that kids are allowed to meet the flamingos from 9 to 10 AM only. Management of the Renaissance Resort has decided not to allow children near the birds for too long to minimize the disturbance of the flamingo population. After 10 AM, families with kids are welcome to visit Iguana Beach, which is more family-oriented. A day pass includes the water taxi trip to and from Renaissance Island, as well as lunch and a drink at the Papagayo Bar & Grill. Every 15 minutes, the boat departs from the ground level of the resort from 7 AM to 7 PM. The ride is operated by staff of the Renaissance Resort and takes less than 15 minutes. However, do note that day passes to Renaissance Island are available for purchase only on days that the hotel is below 80% occupancy. So, if you’d like to purchase one but you’re in Aruba during a peak week, it’s best to call the concierge or visit the resort on the day prior to your planned visit to check if they still have any passes available. Unfortunately, day passes cannot be pre-booked. 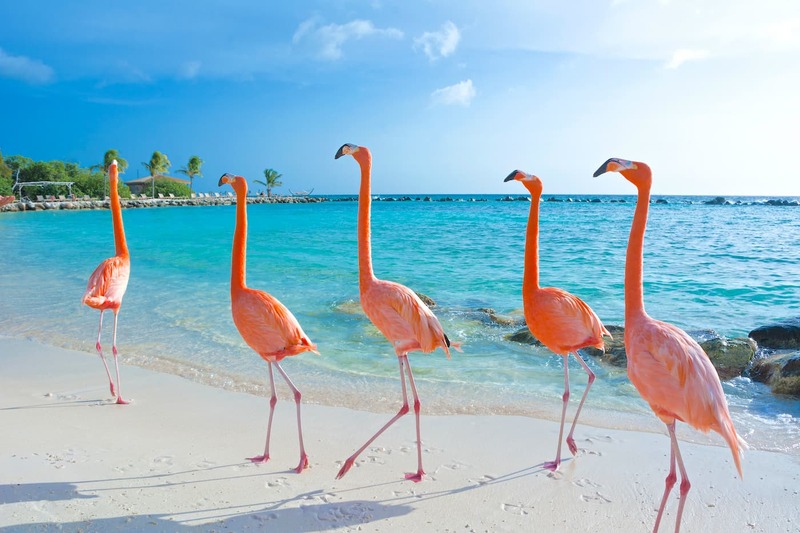 Three pink flamingos strolling along the water at Flamingo Beach, Aruba. Feeding the pink inhabitants of Flamingo Beach is a unique experience. Where else can you be so up close and personal with flamingos? On the beach, there’s a vending machine that sells flamingo food. It costs 50 cents, so bring a few quarters. If you’re lucky, and the birds are still hungry, they’ll gently eat out of your hand. That’s the moment you’ll want to make a picture, or have someone take it for you. If the flamingos aren’t hungry, they’re probably taking a nap or striking that characteristic flamingo-pose, standing on one leg. In any case, always try to approach the flamingos without scaring them. There will be plenty of photo opportunities for sure, but please do not chase the birds to get a selfie. To feed the flamingos, it is best to go early in the morning around 8 AM, when the beach is usually less crowded. Flamingo Beach offers privacy, quietness, and a spectacular view of the pink flamingos looking for food in the shallow waters. Just sit back, relax, and watch the world go by. As the birds casually walk around the beach, the only sound you mostly hear is the wind going through the leaves of the swaying palm trees. The beach offers good protection from the trade winds too, which means that you’ll have to apply sunscreen extensively and cool off by going into the water often. Fortunately, drinks, food and snacks are very close by to order at the Papagayo Bar Grill and the newly added Mangrove Beach Bar.